Sri Lanka has been witnessing a persistent weakening of its export capacity, with the exports to GDP ratio falling to a low of 16.4 per cent in 2012, and a declining share of the global export market. In 2012, earnings from exports contracted by 7.4 per cent, and have continued to contract by 8.1 per cent in the first quarter of 2013. At a time when export capacity is weakening, Sri Lanka’s appetite for foreign sources of funding to bridge its resource gap has been on the rise. Since obtaining a sovereign credit rating in December 2005, Sri Lanka has so far issued five sovereign bonds to the tune of US$ 4 billion beginning in 2007 (Table 1). This was accompanied by an incremental opening up of the government securities market to foreign investors. The threshold limit of 5 per cent of Treasury bonds outstanding introduced in 2006 was relaxed to 10 per cent in 2007. In 2008, Sri Lanka opened its Treasury bill market to foreign investors with a threshold limit of 10 per cent. In December 2011, the threshold limit was further expanded to 12.5 per cent of outstanding Treasury bills and Treasury bonds stock. Regulations governing foreign borrowing by Sri Lanka’s private sector have also been eased to encourage private firms and commercial banks to tap foreign sources for funding. For example, the imposition of an 18 per cent ceiling on credit growth of Licensed Commercial Banks (LCBs) in 2012 was relaxed to 23 per cent, so long as the additional funds were borrowed from overseas. The Budget 2013 presented in November 2012, permits LCBs and corporate entities to borrow up to US$ 50 million and US$ 10 million, respectively, each year for three years without the approval from the Department of Exchange Control. Such moves have prompted many private LCBs to resort to foreign borrowing, including plans by the state-owned National Savings Bank (NSB) to issue a US$ 1 billion international bond. Notes: a: Includes capital and current transfers, inflows from Treasury bills and bonds and long term loans. Source: CBSL, External Sector Performance, December 2012. Enhanced volumes of foreign currency denominated borrowing raise a country’s exposure to external shocks. Indeed, the associated risks to an economy from short term flows, and foreign capital accumulation by the private sector, are well known and recognized. The risks can be better managed in the presence of a buffer from an accumulated stock of official foreign reserves. As evident from a comparative perspective, Sri Lanka’s ratio of external debt stock to exports is high, and compares poorly against the average for developing countries (Figure 1). Of equal concern is that the country’s ratio of reserves to external debt remains low vis-a-vis the average for developing countries. Source: World Bank, International Debt Statistics 2013, World Bank, Washington, D.C. The stability and composition of Sri Lanka’s official reserves have been areas of concern. 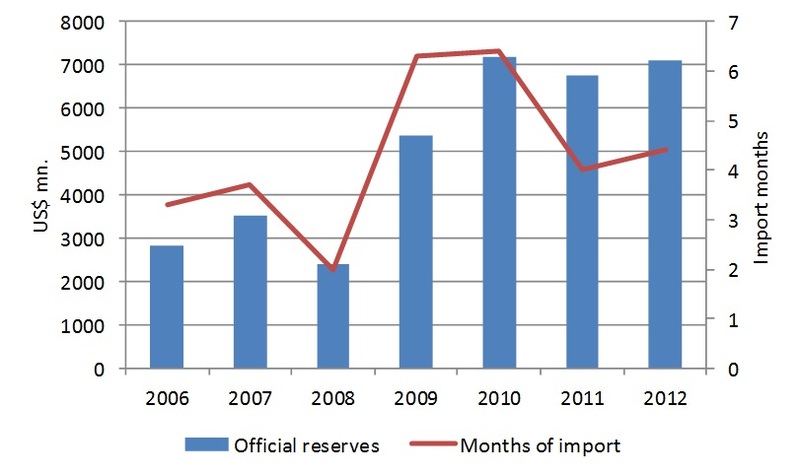 Official reserves declined to a low of US$ 1.3 billion in March/April 2009 as the Central Bank of Sri Lanka (CBSL) attempted to support the currency by selling off reserves (Figure 2). Reserves dipped to provide cover for only 1.2 months of imports, well below the international benchmark of 3 months of imports. With the end of Sri Lanka’s 30 year conflict in May 2009, the country began a gradual process of rebuilding its reserves through an IMF Stand-By Arrangement, short term capital inflows to the government securities market, and the issuance of sovereign bonds at regular intervals. Reserved peaked at US$ 8 billion in July 2011 before once again dipping to US$ 5.5 billion in February 2012 with 3.2 months of import coverage, as the CBSL once again attempted to prop up the exchange rate. With the decision in February 2012 to allow the exchange to move freely, and issuance of a US$ 1 billion sovereign bond in July 2012, official reserves were once more built up to US$ 7 billion with 4.4 months of import coverage by end 2012. 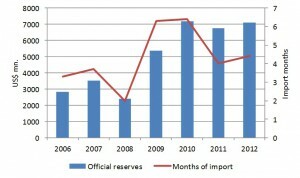 Notes: Official reserves and months of import as at year end. Source: CBSL, Annual Report, various years. In terms of the composition of Sri Lanka’s reserves, the bulk of it is made up of foreign borrowings, including funds raised through issuance of 10 year bonds. In issuing long term bonds and buying reserves, governments are likely to consider not only the current borrowing cost but also future borrowing costs. Here, by simultaneously issuing long term bonds and buying reserves, governments accumulate resources that it can use in periods of higher borrowing costs. However, a cost is entailed in that the return on purchased reserves may be considerably lower than the borrowing costs. Higher costs can be off-set, dependent on the extent to which future borrowing costs are likely to increase. The strategy of buying reserves carries risks, particularly when a country’s capacity to accumulate resources from non-borrowed sources by raising earnings from exports of goods and services is on the wane. The purchase of government debt by non-residents and purchase of international reserves by governments are both pro-cyclical. During good times with lower default risk, governments may be tempted to borrow more. In the event of any shock to the economy, governments will be forced to cut down on borrowing and use available reserves to smooth out consumption. These conditions can result in a collapse of both the purchase of government debt by foreign investors, as well as the ability of governments to raise foreign borrowings, leading to external crises. Despite higher foreign borrowing, viewed at aggregate, Sri Lanka’s external debt dynamics appear not to have changed very significantly in terms of the external debt-to-GDP ratio. It increased slightly to 36.5 per cent in 2012 from 35.6 per cent in 2011, largely on account of the sharp depreciation of the exchange rate. However, the overall debt-to-GDP ratio masks the growing external debt service obligations on Sri Lanka, arising from changes to its composition. 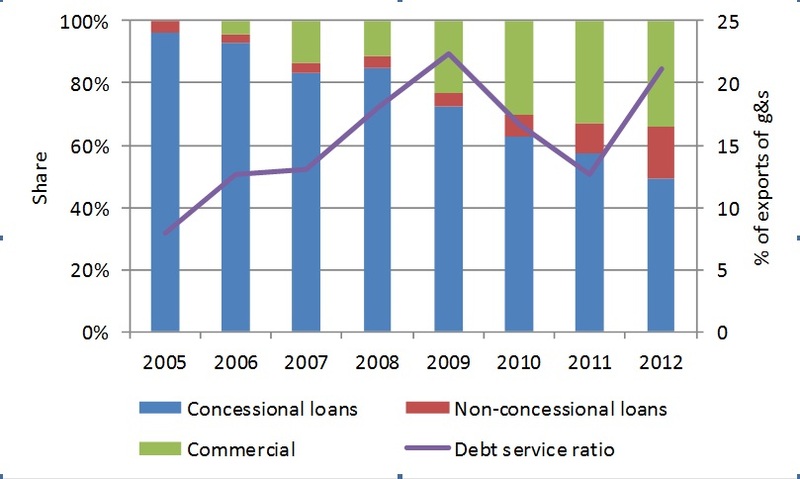 As more foreign resources were raised on non-concessional terms, the breakdown of external debt composition has changed swiftly, with the share of non-concessional and commercial borrowing rising to 50.5 per cent of total external debt in 2012 from a share of 7.2 per cent in 2006 (Figure 3). The ratio of debt service to exports of goods and services shot up to 21.2 per cent in 2012 on the back of higher re-payments, including settlement of the first sovereign bond for US$ 500 million issued in 2007. Notes: a: Debt service ratio taken as percentage of exports of goods and services. Sri Lanka’s external debt has grown at an annual average of 16.4 per cent during 2006-12, while earnings from exports of goods and services have grown at only 8.7 per cent during the same period. The spike in the debt service ratio in 2012 is indicative of the pressures that big repayments can exert. While long term bonds allow for hedging rollover risk, Sri Lanka will already see a significant ‘crowding-in’ of its external debt repayments during 2020-22 as the Sovereign bonds issued from 2010-12 mature. Whilst there are no immediate plans to issue similar Sovereign bonds in 2013, the uptake of foreign borrowing by state-owned banks and other private entities entail continued external sector risks for the country as a whole. The build-up of external payments stress is a cumulative process, where the lines between external public debt, public-guaranteed external debt, and private sector external debt become blurred, and virtually disappear at times of external payments crises. The most prudent strategy to insulate an economy from rising exposure to foreign debt is to ensure a healthy growth in earnings from exports of goods and services, and build-up a ‘war chest’ of non-borrowed official reserves. Mind the Gap: How Will Sri Lanka Finance its Development Needs? Thanks for this very useful piece. A few questions and a comment. Q1; Do ‘govt inflows’ in the first part of Table 1 for 2011, 2012 include the Sovereign Bonds shown in the second part of the same table for 2011, 2012? 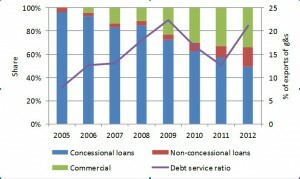 Q2: Why is the commercial bank borrowing for 2011 in Table 1 for 2011 left blank? Should it read NIL or has a figure been omitted? Q3: Are the bar charts in Figures 2 and 3 annual averages or end of year values? Inter alia you say “.. by simultaneously issuing long term bonds and buying reserves . . . a cost is entailed in that the return on purchased reserves may be considerably lower than the borrowing costs”. In order to enable readers to form their own judgement on the matter can you please let us know the yield (interest rate) on the 5 sovereign bond issues shown in table 1. Also please let us know the current interest rates the government receives on the “purchased reserves” at this point in time. Thank you and please alert me when a reply is posted. Q3: Figures 2 & 3 depict end year values. Data on how sovereign bonds are trading and investment plan for SLs reserves are not available to answer general query. You talk about a level of external debt-to-GDP ratio to 36.5% in 2012. It seems to me it’s the foreign currency denominated (35.6% in 2011). The external debt reach 49.8% in 2011 and so the dynamic isn’t the same with a growing to 56.7% in 2012. However, despite my research, I’m unable to find the distribution between private and public sector external debt. Have you this information? Thank you very much for very useful details which help for my study.I am officer of SL Army ,presently following Bsc degree in management.I have to write assignment on following tropics. 1. Critically analyze the export/import performance of SL for past four years. 2. Impact of letting the domestic currency fully float,on the economy. 3. What is the better policy option for the government to reduce the trade imbalance? It is import Substitution or policies to enhance. Please give relevant guidelines and brief me that which area I should cover to complete my assignment. Really useful article on the recent debt weight of Sri Lanka. Data been used for my assignment.